Kerala, a narrow, fertile, tropical strip of land in the south - west corner of India, is one of India’s most iconic Kerala tourist destinations and home to some absolutely unmissable sites and experiences for the visitor. This part of the subcontinent a long history of interaction with traders from foreign lands - Arab, Chinese and later European maritime powers came here in search of the pungent spices grown in profusion on the plains and hills of this tropical paradise.These same spices are still grown today and a visit to	a spice garden is often a highlight of many peoples’ time in Kerala. 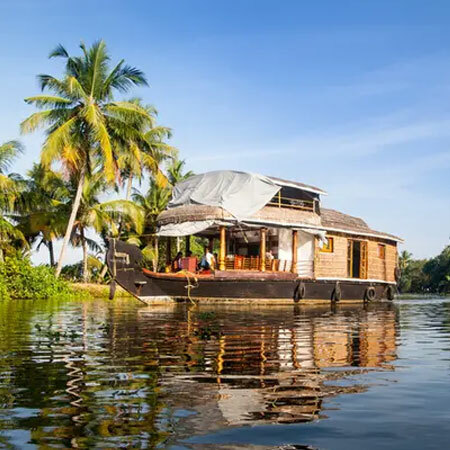 The world famous Kerala Backwaters - many hundreds of kilometers of rivers, canals and streams in the area between Alleppey and Quilon in the central part of the state - are often described as one of the must - see destination of the world and it is hard to argue with this logic. The experience of cruising on the backwaters on board a private houseboat (usually a converted rice barge) is almost impossible to over - hype; stunning scenery, balmy tropical weather, delicious freshly prepared meals and an overall sense of being in one of the most perfect places on Earth - a visit to Kerala without time on the backwaters is perhaps not truly complete. The harbour city of Cochin has been Kerala’s major port for over 500 years and has absorbed myriad influences as a result of this long period of interaction with other cultures. Time here will reveal the impact of Chinese, Arab, Dutch, Portuguese and British cultures (among others) on the city. The nearly 600 kilometers of Kerala’s coastline is another magnet for visitors and although the beaches are the equal of many in more famous Asia resort areas, the level of development is generally much less significant making a ‘classic’ coconut palm-fringed idyll a very attainable dream on almost any budget. In the high hills of the Western Ghats, alongside spice gardens and rubber plantations are vast swathes of virgin forest; home to elephants, tigers and countless other species. Plantation Homestays are another great way to experience Keralan hospitality and cuisine - many families whose children have grown up and moved away have opened their homes to guests and there can be no better way to learn about the traditions of Kerala than in the friendly atmosphere of one of these welcoming homes. The artistic culture of Kerala is diverse and unique with Kathakali dance, the traditional martial art of Kalarippayattu and the mysterious shamanistic ritual of Theyyam being among those forms which can be seen in different parts of the state. Kerala’s Tourism Department describes this as ‘God’s Own Country’ and many thousands of visitors from around the world would be highly inclined to agree! There are so many tourist places in Kerala to visit like Tea Museum, Padmanathapuram palace, Hill Stations, temples, beaches and many more.